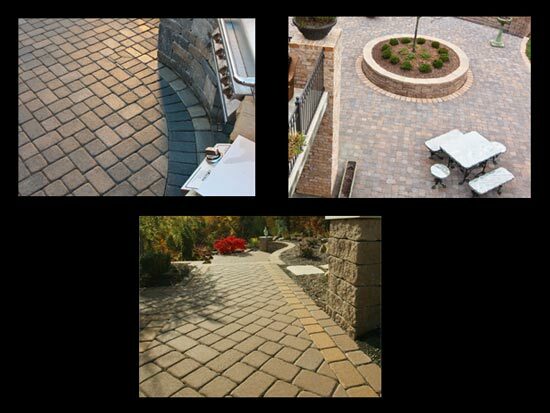 Interlocking Concrete Pavers by Innovative Concrete Design Inc.
A special type of paver referred to as an “interlocking concrete paver” or also a segmental paver has emerged over the last couple of decades in the United States as a very popular alternative to brick, clay or concrete. Segmental pavers have been used for thousands of years. The Romans built roads with them that are still there. But it wasn’t until the mid 1940’s that pavers began to be produced out of concrete. It started in Holland where all the roads are made to be flexible because Holland is below sea level and the ground shifts, moves and sinks. Poured concrete is not an option because it will crack. Individual units not set in concrete placed in sand perform far better than concrete. Before the paver was made from concrete either real stone or a clay product had to be employed. The first concrete pavers were shaped just like a brick, 4” by 8” and they were called Holland Stones and still are today. These units turned out to be far more economical to produce and were exceedingly strong.